After trials of drone deliveries by Amazon and DHL, it is Ele.me the Alibaba-owed meal delivery service that has been able to get regulatory approval from the Chinese Aviation Authorities to use drones for deliveries along specific routes for commercial services. Initially the 17 approved routes are within the suburbs of Shanghai. This service promises delivery of orders with 20 minutes of your order being placed. The deliveries are not however made directly to consumers, but to agreed local collection points. They expect that this will evolve over time with other delivery options. What is clear is that consumers are excited to have quicker deliveries of orders, which at the same time will cut down pollution and costs. Amazon is also continuing to develop automated drone technology which can been seen in their recent filed patent that focuses on communication between a client and a delivery drone. Deutsche bank has predicted that the largest opportunity for cost reduction within Amazon may come from utilising drone delivery to reduce their last mile delivery costs. Although obviously whilst this may become the perfect delivery method for lightweight parcels, luggage shipping services may have to wait a long time before this automation affects them. 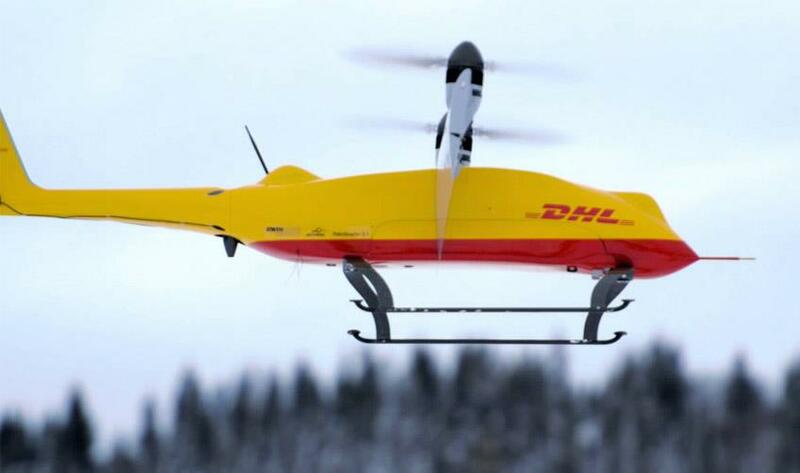 DHL the large international courier service is continuing to develop their drone delivery trials and are onto the third generation of their Parcelcopter. to do. The initial trials started in 2014 flying over water to Juist in Lower Saxony. The latest trial used a “Skyport” base where selected clients could load or collect parcels from. The trial was within the Reit im Winkl area of Germany and the drone would take-off and fly to another Skyport 8 kilometres away, in only 8 minutes. This compares to the same journey taking 30 minutes by car. The new Parcelcopter can carry and increased payload of 2 kilos up from 1.2 kilos in the initial versions. DHL is at the forefront of new technology in the courier industry and has a track record of using technology to improve the customer experience and efficiency of their services. For example if a client needs to send a parcel to Germany, it now benefits from automated route planning for its journey, text notification of the delivery window for convenience and will travel on one of the greenest delivery fleets in the industry. So it comes as no surprise that they are continuing to invest in and test delivery drones. With the financial resources of companies such as DHL, Amazon and Alibaba all investing in drone delivery services, it is no surprise that we are now seeing the first commercial applications for this technology being released. With 47% of consumers expressing an interest in same day drone delivery (with this rising to 72% of younger millennials) the development and roll out of these services is set to continue.